We offer LCD Calendar Wall Clock. Inspired by our clients we have now started to manufacture and supply a wide array of Calender Clock. Available in different colors, shapes, sizes and finishes, these are of high utility in office and corporate sector and known for their unique features such as smooth texture, classic design and durability. 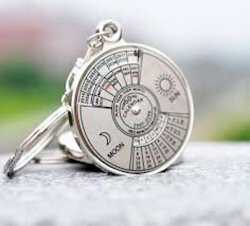 We are involved in providing an extensive range of Customized Lifetime Calendar with Clock, which is made by accomplished professionals who employ the advanced techniques. Perpetual wooden calendar, with glossy finish, apt for any corporate desktop. It comes with a clock attached to it, which adds to the utility of the product. Perfect for any corporate gifting purpose. Dial Size: 3.347" x 3.347"
Printing Size: 2.5" x 0.75"
Folding Clock - A unique idea for table clock in Ecofriendly manner.